A sense of ease and assurance compliments the inherent Zoom-Zoom feeling of a Mazda, thanks to the proactive safety philosophy that underscores everything we do. With the aim to create a safe and accident-free automotive society, Mazda�s research and development of safety technologies is based on understanding, respecting and trusting the driver, to reduce the occurrence of accidents and injury. The result is a comprehensive array of safety technologies that support the driver, which Mazda calls i-ACTIVSENSE technologies. As soon as technologies evolve and advance, they are applied to Mazda vehicles, with the benefits passed onto customers. With the belief that safety should come standard, many of the i-ACTIVSENSE technologies are applied to all new model grades. New Mazda6 and Brand-New Mazda CX-8 Diesel exemplify this approach, packed with the latest in i-ACTIVSENSE advanced safety technologies from the entry-level Sport, with even more features added to the range topping variants. From millimetre wave radars, to an array of miniature cameras placed at key points around the vehicle, Mazda continues to develop, enhance and evolve its safety technologies to offer drivers better peace of mind. This lane support system will monitor markings on the road and will alert you if you�re straying from you lane. If you don�t take action, it will apply corrective steering to help guide you back. This emergency brake assist function monitors vehicles in front and behind you to assess the likelihood of a collision. If there is a high risk, the system will warn you and brake automatically if needed, helping you avoid a collision or minimise it. The Adaptive LED Headlamps system individually controls a number of LEDs to broaden visibility at low speeds, avoid dazzling other drivers while on high beam, and extend vision at highway speeds. Intelligent Speed Assistance systems works in conjunction with Traffic Sign Recognition (TSR) to allow you to limit your speed dynamically, based on the speed limit in an area, with the touch of a button. With the ability to bring you to a complete stop in traffic and take off again once traffic moves, the system automatically adjusts your speed to maintain a safe distance from the car ahead. By scanning external mirrors� blind spots up to 50m behind your vehicle, radars detect unseen vehicles to alert you of any potential hazardous lane changes. This kind of technology puts the safety of the driver, passengers and pedestrians first. 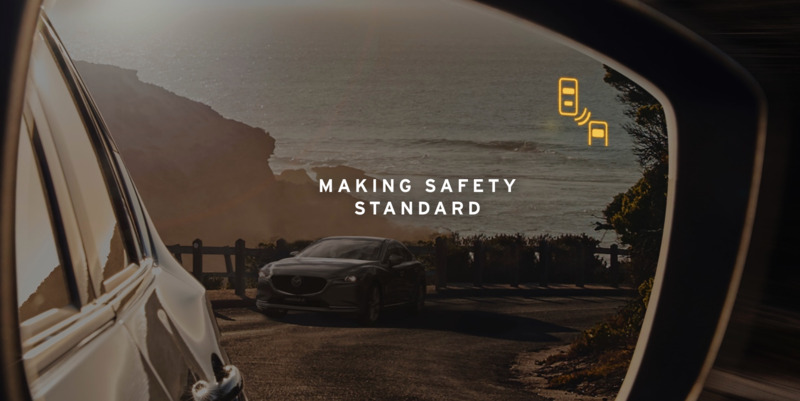 If you�d like to learn more about Mazda�s i-ACTIVSENSE safety technologies talk to your local team at Sunshine Coast Mazda today!